Bitcoin – will you still be there when it all goes bang? This paper is written as a result of trying to understand the current mania in the price of Bitcoin and other crypto-currency. The hysteria has captured peoples attention – drawing more people into the trap. Here are our thoughts. Currencies are set up by sovereignties ie countries. They were backed by the gold standard – and have a heritage of having a tangible value backed by assets. Over time the gold standard has been removed and replaced with other measures of asset value. There are regulations, ratings, economic data points (interest rates, international trade), currency relativities … and so on. Countries defend their currencies as a critical instrument in their care. The financial world has worked hard to create legitimate currencies – so as to minimise the financial risk of its currency. Regulators are manic about maintaining a safe, secure financial system – with safeguards on currency and movement of money within an economy. The taxation office, banking and policing are based on being able to track money flows – replicated in each country. Investments or trading in currency are made based on sound analysis of these known facts. These facts mentioned are taken for granted and currencies are accepted as ‘safe’. Bitcoin is a virtual online currency – it’s like money for scammer and criminals. Most people call it crypto-currency. I am going to refer to it from now on as crypto-money as calling it a currency is misleading, deceptive and dangerous. Bitcoin’s price is heavily influenced by a lack of government regulations, speculators, greed and its current and future adoption by criminals and criminal syndicates. Bitcoin is perfect if you want to be anonymous in your criminal activities as its untraceable by the authorities, the tax office, banking system etc – so no-one can interfere in your potential criminal activity. If you want to be involved in the underworld, get involved – there are a myriad of perfect crimes waiting to happen. Determining the price of a Bitcoin is different to actual currencies. It doesn’t have any precious metal backing it – therefore it really doesn’t have a value other than scarcity. So its down to demand and supply. As long as demand outweighs supply then the price will go up (finally economics comes in handy!). Why is it going up? More buyers than sellers. How many new crypto-monies are being invented? What is their reputation? How many crypto-monies have been hacked? Have people had their crypto-money wallets drained? Check into why China disallowed crypto-money exchanges in China – could it be to protect its people and the value of its own (real) currency. This crypto market is full of corrupt operators. In the short term there is likely upside as more shady characters are attracted to deal further in crypto-currencies. Given the anonymity they can easily lurk and prey on unsuspecting individuals. We expect this criminal activity will rise as the opportunity for abuse becomes more widespread. Well, there is no regulation. Manipulation will continue to occur in the absence of regulation. We expect governments will attempt to impose regulation to curb this. This must reduce demand for crypto-money. The longer this price rise of Bitcoin goes on, the greater the risk it poses to itself. We see more technology being created in the crypto space – and with this, a higher risk of people being ripped off. There will be more competitors where there really have been few to date. Mostly the world has one currency per country. But with virtual currencies – the sky is the limit. Soon we will have a market full of such currencies, some of which will be literally set up for cheating the system. Whilst there may be money to be made near term, in the medium term we see the punter being bitten by craftier and cleverer people. Every generation has one big event which is sent to relieve them of their hard earned cash – it appears the current generations is crypto-money! Normally people are used to a financial system with regulation. Psychologically they are being drawn into being invested in crypto-money. But the truth is they are lambs to the slaughter. There may be more upside in crypto-money but its a punt not an investment. 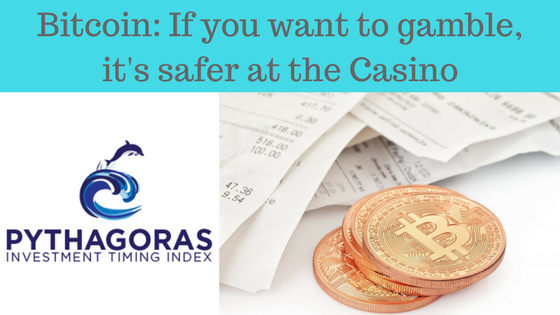 If you want to gamble, better to go to the casino – the odds are better!